This iPhone data recovery tutorial centers on top easy methods to easily and fast recover iPhone data (music, videos, TV shows, ringtones, ebooks, photos, contacts, call history, SMS messages and more) from iPhone 8/7/6/5, computer, iTunes backup or iCloud backup. Almost everyone expects the new features of iPhone 8 like edge-to-edge OLED display with True Tone technology, home button located on back or integrated into display, new Touch ID featuring face or iris scanning, wireless charging, etc. In fact, with the coming of iPhone 8 and iOS 11, you should pay more attention to iPhone data security issue and you'd better learn some efficient iPhone data recovery ways, tools, apps, etc. Frankly, in addition to iOS update or iPhone upgrade, there are many other common situations causing iPhone data loss like mistaken deletion, factory reset, system problem, being stolen, water damaged, screen broken, failed jailbreak and more. To most of people, the data file on iPhone is the most important thing rather than an iPhone. And because of that, we list top 4 ways for iPhone 8/7/6/5/SE users to painlessly retrieve iPhone lost data. MacX MediaTrans is a professional iPhone data manager to easily transfer photos, videos, music, TV shows and more data file from iPhone to computer for backup and restore those data to iPhone 8/7/6/5/SE at anytime. No iTunes/iCloud! No matter you want to upgrade to the new iPhone 8/iOS 11 or jailbreak iPhone 8/7/6/SE/5, you'd better backup iPhone data at first via functional iPhone data transfer software in case of any data loss. Actually, comparing with figuring out practical iPhone data restoring software, backuping iPhone data beforehand is the most economic and time-saving way. MacX MediaTrans, one of the most useful iOS data transfer apps, is able to readily backup all sorts of data (music, photos, video, ringtones, iBooks and more) on iPhone 8/7/6/SE/5 to computer and fast transfer the backed-up iPhone data from computer to iPhone. Obviously, the whole iPhone data recovery process is simple and efficient though your iPhone is stolen. After all, a majority of iPhone data retrieving apps need connect to your iPhone when recovering iPhone data. Please download this iPhone data transfer on your Mac computer before following the below step-by-step guide; if you are a Windows user, you should download Windows version. Step1: Launch this software and connect your iPhone to Mac via a USB cable. Step 2: Select iPhone data type (photo, music, video, book and voicememo & ringtone) you want to backup on the main interface. Then, you will enter the correspondent data backup windows. And check the box of "Select All" to choose all your photos, music, videos, etc as you like. Step 3: Click "Export" button to backup iPhone data to Mac/Win. You need transfer your backuped data from computer to iPhone once your iPhone data got lost after iOS 11 upgrade. Basically, the data recovery iPhone steps are same to the above data backup steps. You just need to hit "Add Music", "Add Video", etc button in each Window to restore file data to iPhone 8/7/6/5. Beyond doubt, many people will rely on iCloud or iTunes to back up iPhone data (messages, contacts, notes, photos and more) and make them recoverable when iPhone suffers from accident data loss. These two programs are free and easy to use. 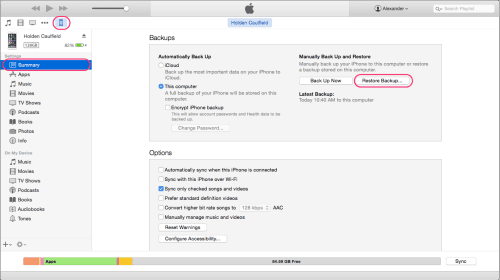 To recover iPhone data from iTunes backup, you can: connect your iPhone 8/7/6/SE to computer and open iTunes > go to File > Devices > Restore from Backup; or click the device button > go to the Summary tab > click Restore Backup. Later, you can choose the backup file you want to restore. To restore iPhone data from iCloud backup, you can: go to Settings > General > Reset > Erase All Content and Settings > go to Setup Assistant mode > swipe on the screen to begin the setup process > join a Wi-Fi network > tap Restore from iCloud Backup > sign in with your Apple ID > pick your preferred backup. The iPhone data recovery time largely depends on the size of the backup and the network speed. When it comes to iPhone recovery data, some people prefer to choose a functional iPhone data recovery tool in consideration of convenience and feasibility. And Aiseesoft FoneLab is decent one, which is designed especially for recovering data from iPhone 7/8/6/SE like contacts, call history, SMS messages, reminders, history of Safari, music, videos, etc. Next, let's check its main features. * Recover some files even deleted long time ago. Comparing with paid best data restoring software for iPhone, lots of users would like to take advantage of free data retrieving software for iPhone like EaseUS MobiSaver Free. It is able to scan lost data, preview the detailed information of the lost data and recover them from iPhone, iTunes backup or iCloud backup. 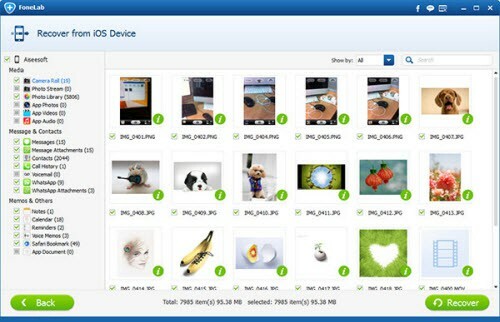 And EaseUS MobiSaver Free also can freely recover up to 12 types of data from iPhone. Step 1: Connect your iPhone to computer and choose "Recover from iOS Device" mode. Then, click "Scan" button on the right side. 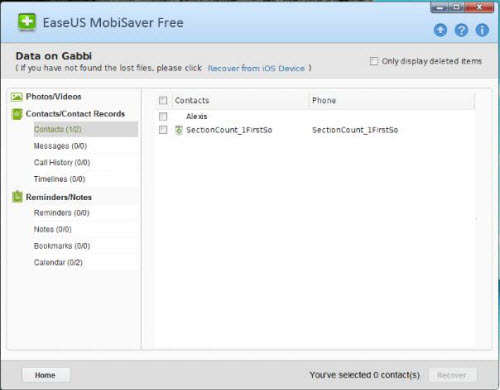 Step 2: EaseUS MobiSaver Free can automatically scan your iPhone to find out and analyze all the existing and deleted files. You can also click "Stop" button to cancel the scanning task. Step 3: Select out all the iPhone data you desire to get them back with one click on "Recover" button. This best iPhone data transfer provides users the simplest solution to easily backup and retrieve iPhone data including music, video, TV shows, photos, ringtones and more.